New social contexts connected with the collapse of USSR gave a strong impulse for contemporary artists in Siberia to look for new signs of their identity to be expressed in their art. One of the most significant and most vividly explored â€œsignsâ€ of this search has become the turn to the past. In the sphere of visual arts this has been manifested in numerous adaptations of prehistoric art motifs, particularly ancient petroglyphs. These petroglyphs which have been perceived as the most vivid materializations of Siberian shamanism considered to be a core of Siberian culture and tradition. This paper tries to summarize this artistic movement, known as Archaeo-Art or Neo-Archaika, with particular attention to the question how the prehistoric rock art is used. Are the meanings attached to the petroglyphs free artistic interpretations or do the artists base their work on archaeological interpretations? What are the relationships between archaeological (scientific) and artistic interpretations, and is contemporary â€œshamanicâ€ art new social power able to influence new social context? The presentation is based on examples of the art of chosen Siberian artists from Altai and Khakassia. The world view of the people inhabiting the Amur valley is presented in shamanic iconography. In that, the space surrounding a human is structured relatively to the World tree, which is the axis of the Universe. The arrangement of the Upper and Lower areas is projected onto the earth plane, which is as embodiment the Middle world. Hierarchy and dualism, which form the basis of the sacred universe, in the earthâ€™s (average) field can be expressed by areas of the natural landscape. Among people inhabiting the Amur valley (Nanai, Ulchi) fishing and hunting were the economic activity, which was reflected in the separation of space on taiga (terrestrial) and aquatic fields. Located in the lower part of the valley of the Amur River, floodplain and taiga landscapes with their inhabitants were the key sections of sacred topography. The location and names of some mountain ranges, coastal rocky ledges, river and lake islands indicate the sacredness of the placenames. They appear in the shamanic chants regarding sending deceased souls to the underworld (boonie) as stops that the shaman is forced to do during the complex trans-flight. Some places along the channel of the Amur River and its tributaries function as ceremonial sites in the ritual complex of the Nanai people. They are related to the pantheon of entities that are involved in the creation of world. Legends about these places fit into the narrative of the origin of the world, the earth. According to fishing ethics, these miraculous nature monuments are the taboo areas. Any economic activity on them is prohibited. Industrial development of the Amur region has caused the transformation of the traditional worldview and with it has changed the contours of the sacred space. In the rock art produced by the ancestors of the Sami people of northern Europe we can see traces of a shamanic world which often included images of travel, e.g. boats, skis and snowshoe footprints. These images date from Stone Age times onwards and continue up to the Viking Age and Medieval periods. They can be interpreted as icons (in the Peircian semiotic sense) that symbolise travel to other worlds, produced by shamans (noajdde) or by others living in shamanistic societies. Access could be achieved by states of consciousness induced by drumming and dancing, enabling the noajdde to travel to other worlds. Similarly images in rock art of certain animals and birds are best interpreted as symbols of flight, just as (in Sami folklore) swans flew away southwards in the autumn towards the realms of MÃ¡ttarÃ¡hkka (Mother Earth), and just as otters and loons could dive underwater to visit the realms of the Underworld. In this paper I shall argue that the noajdde survived earlier challenges to their role, for example when the medieval fur trade threatened to destabilise Sami society through the influx of new wealth. The evidence of an increase in metal items like jewellery and coins deposited in sacrificial sites suggests that the Sami responded to fur trade wealth by means of rituals akin to â€˜potlatchâ€™ through which incipient wealth was dissipated and an egalitarian society was maintained. By 1600 there was a new threat from the colonial encroachment of settlers and the Swedish state, and the noajdde faced a direct political challenge from the Lutheran Church missionaries sent northwards from Sweden and Norway to convert Sami pagans. As a by-product of this confrontation the production of images on Sami drums increased in the 17th and 18th centuries. At this time missionaries outlawed the old religion, confiscated and destroyed drums, and persecuted shamans. The sacrificial sites continued to be respected and sometimes used in new ways, but by the 19th century it had become dangerous to own or to use drums, inscribed as they were with boats and with other images of shamanic travel, except in covert ways. Sami shamanic practices, especially those involving healing, have developed in new ways syncretic with Christianity. In Trentino, Italy, at 1300 meters altitude is the epigravettian Dalmeri rock Shelter site, a fascinating prehistoric hunting camp, dated at the end of the glacial times. A unique set of 265 painted stones was found here, like no other prehistoric site in Europe. The ochre silhouette rock paintings have human, animal and plant subjects, with abstract markings and handprints, but also clearly organized traces of a red pigment: a typological and stylistic variety that has triggered an intense series of studies on the artistic and religious life of the men of the time. 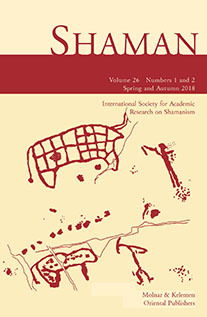 Stimulated by the proposed theme of the International ISARS Conference (Greece, October 2015), in this paper we propose a survey that compares the archaeological model of prehistoric art, specifically that of the Dalmeri Shelter, with shamanic practice, a privileged field in the study of the history of religion and anthropology. We are aware of the pitfalls that such comparisons involve: the prehistoric art that we know is only a â€œremnantâ€ of a far more complex belief system. In addition, given the huge gap in time between prehistory and the first scientific observations of historical Shamanism, we believe that investigation of these themes can find a legitimacy that goes far beyond any supposed affinities between art objects from differing cultures. The Dalmeri Shelter paintings and shamansâ€™ rituals and artifacts tell us of the conditions of life at the time, but also offer a â€œmagicâ€ or â€œspiritualâ€ cosmogony of time and space. In order to enter into a trance, shamans use different means. One of them is intoxication and hallucination with the help of drugs and toxins. The use of drugs in religious rituals was known in Scythian culture as it was described in the work of Herodotus, where- during the cleansing ceremonies- the Scythians sat in a small bath-tent, threw cannabis seeds on burning hot stones and inhaled the steam of this drug. After this procedure, they become elated and shout for joy. We find direct analogies to the steam bath-tent, with half-burned cannabis seeds in the Second Pazyryk burial mound in Altay, belonging to the Siberian Scythian. Another method of entering into a hallucinatory state would be the use of strong toxins, such as poisonous mushrooms â€“ Amanita Muscaria. Some unique replicas of this mushroom, made from an animal bone, were found in burial mounds of the Khodzhaly-Kedabek culture in Azerbaijan and Timber-grave culture of Bashkortostan. Even though these cultures were using drugs and toxins it is difficult to establish if they practiced shamanism. In this paper the author offers a methodology for determining if shamanism was practiced in an archaeological culture. The methodology is based on the comparative (interdisciplinary) research of written sources, archaeology, ethnography and mythology. Different objects and ornaments from graves, construction materials, burial stratification and rituals are examined and compared with ethnographic materials and ancient historical sources.